WASHINGTON (Reuters) - George Papadopoulos, a former aide to then-Republican candidate Donald Trump's 2016 campaign, was sentenced on Friday to 14 days in prison after pleading guilty last year to lying to federal agents investigating whether campaign members coordinated with Russia before the election. Prosecutors for Special Counsel Robert Mueller said Papadopoulos lied to agents about his contacts with Russians during the campaign "to minimize both his own role as a witness and the extent of the campaign's knowledge of his contacts," according to the government's sentencing memorandum. Among those contacts were London-based professor Joseph Mifsud, who told him the Russians had "dirt" on Trump's Democratic presidential rival Hillary Clinton in the form of "thousands of emails." Russia has denied U.S. allegations that it interfered in the campaign and President Trump denies campaign collusion. Prosecutors had asked Judge Randolph Moss in U.S. District Court for the District of Columbia to impose a prison sentence of up to six months, saying that Papadopoulos' lies impeded their investigation and that he did not cooperate. "He didn't come close to the standard of 'substantial assistance,'" prosecutor Andrew Goldstein told the judge at the sentencing hearing. "It was at best, begrudging efforts to cooperate." 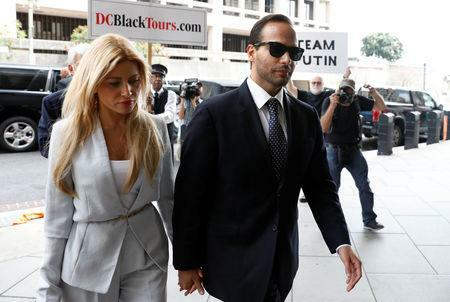 "I hope to have a second chance to redeem myself," Papadopoulos told the judge. "I made a dreadful mistake but I am a good man," he said. He and his wife left the courthouse without speaking to the press. However, Papadopoulos' mother Kiki told reporters she was satisfied he had received a fair sentence. "I am very happy with the judge. He was very fair," Kiki Papadopoulos said. "I would have preferred less time in jail, but that's okay. It will give him time to think things over." His mother said on Friday that she "still supports" Trump. The sentence that George Papadopoulos received is about half the prison time given to Alex van der Zwaan, a lawyer who was also charged with lying to the FBI during the special counsel's probe. Van der Zwaan was sentenced to 30 days in prison. Moss said he wanted to impose some prison time because while he did not "remotely believe Mr. Papadopoulos was seeking to assist the Russian government," he was nevertheless troubled by Papadopoulos' selfish motives to lie to the FBI so that he would not lose a shot at getting a possible job in the Trump administration. During Friday's hearing, Papadopoulos' attorney Thomas Breen went out his way to praise the FBI, and he also criticized Trump for calling the Russia probe fake news and a witch hunt. 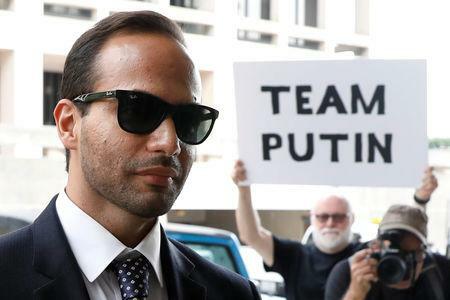 He portrayed Papadopoulos as a naive young man who was "being worked by a pro," a reference to Professor Mifsud, whom he later said he believes was working for Russia and trying to take advantage of his client. "No offense, but he was unsophisticated, he was naive and he was foolish," Breen said in court. Breen told reporters after Friday's hearing that Papadopoulos does not recall telling anyone in the Trump campaign about Mifsud's comments about the Russians having dirt on Clinton. The lies Papadopoulos told in his voluntary interview with the FBI on Jan. 27, 2017, prosecutors said, "undermined investigators' ability to challenge the professor or potentially detain or arrest him while he was still in the United States." In addition, they said Papadopoulos did not provide "substantial assistance" and only came clean after he was confronted with his own emails, texts and other evidence. Sessions has previously testified to Congress that he pushed back against the proposal, but the memo filed by Papadopoulos's lawyers contradicts Sessions' account, saying that both Trump and Sessions appeared receptive to the idea.